Creating a Montessori Geography area in your new Primary or Elementary classroom is a popular area of work. 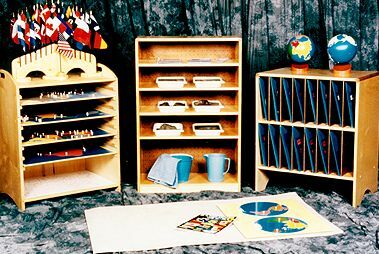 Montessori Woods offers a full line of Montessori furniture to meet these needs. As the teacher discusses distant cultures and lands, these are important tools she will need. A smart baltic birch cabinet holds the maps. Depending on which company you purchase maps, we custom the fit. It retails for $395. The top of the cabinet holds your flag stand or we can make you one to hold flags of the world for $100. The land and water cabinet is designed to hold the land and water forms, the cards, the water bucket and pouring pitcher. Our cabinet is designed for all of the necessary equipment at $375. For those classes that want a place to store Geography folders of the world, the Geography folder shelf is appreciated. It is a good place to store globes also. Folders with plastic sleeves are ideal for storing pictures that the teacher and students can enjoy and add to during study. We can make that for your classes for $425.